The clamorous courtyard instantly went dead silent because of Qian Qiong’s words and actions, so silent once could hear a pin drop. After the arrival of the members of the Ice Pavilion Sect, the Yin Sect, and the Yang Sect, the small courtyard became increasingly crowded. Ji Qingyun, Yu Wei, and the other Heaven Expanse Sect disciples were pushed away from the center of the courtyard by the new arrivals. Ji Qingyun looked very embarrassed, since Qian Qiong had pushed him out of his way when he had trotted over to greet him, full of smiles. However, he rapidly adjusted himself and smiled flatteringly towards Qian Qiong. That was because he was fully aware of how formidable Qian Qiong was. Qian Qiong was at the late Profound realm. It was said that he had recently derived new enlightenment, and was only a step away from entering the Soul realm. All he lacked was an opportunity. Meanwhile, the strength of the Ice Pavilion Sect was second only to that of the Heaven Palace Sect throughout the entire Domain of the Falling Stars, since they had two Soul realm experts in their sect. Compared to the Ice Pavilion Sect, the Heaven Expanse Sect was weaker, and Ji Qingyun’s personal status in the Heaven Expanse Sect was also lower than Qian Qiong’s in the Ice Pavilion Sect. As he straightened his back, he saw Xuan Ke nodding slightly at him, smiling. He instantly realized that it was Xuan Ke, who was rather familiar with his mask, that had told Qian Qiong about his actual identity. With these words, she gave Kong Hong a sideways look. Upon hearing these words, Jiang Zhisu, Fang Hui, and the others from the Realm of Flame Heaven became even more confused. As the only one who knew what was going on, Hu Rong didn’t seem surprised at all. Instead, he continued smiling. Li Jing from the Blood Sect and Jiang Zhisu from the Cloudsoaring Sect gasped at the scene. Ghost Eye, Fang Hui, and the others also widened their eyes in shock. However, they still didn’t know why Qian Qiong and the other experts were here. Nie Tian had assumed a different identity when he had gone through the spatial rift to that strange dimension. Those from the Realm of Flame Heaven had assumed that Nie Tian was still holed up somewhere to avoid the Heaven Palace Sect and the Flame God Sect. They had absolutely no idea what Nie Tian had done in that strange dimension. By the time they had arrived in the Realm of Split Void, they had only learned from the Blood Skull that Nie Tian was also in Shatter City, and that he was cultivating wholeheartedly in one of their cultivation rooms. However, after their return to their sects, Xuan Ke, Chen Hao, Ye Qin, and the other chosen ones had informed their seniors that it was under Nie Tian’s leadership that they had fought off outsiders, defeated those from the Heaven Palace Sect and the other sects, survived Armes’ devastating strike, and made it back to the Domain of the Falling Stars alive. The fact that no one had returned one month after their return also proved how special Nie Tian was. Yu Wei was also flabbergasted as she stared at Nie Tian, as if she now found it acceptable that she had been defeated by him. Nie Tian’s name had long been imprinted in their minds since he had obtained the three fragmentary star marks, sealed the three major spatial rifts, and refused to join the Heaven Palace Sect. “What was happening here?” Qian Qiong asked coldly. Hu Rong laughed softly and briefly explained the matter to him. “I didn’t hear of such arrangements either,” Lu Ling from the Yin Sect chimed in with a sarcastic tone. Cornered by the three, Ji Qingyun’s expression flickered as he wanted to argue. However, he couldn’t find any proper excuses. “Also, don’t forget that Nie Tian went to explore that new dimension upon Master Zhen and the Tool Sect’s invitation,” Kong Hong added. Ji Qingyun was at a loss for words. With a shocked and uncomprehending gaze, he glanced over Kong Hong, Lu Ling, and Hu Rong, who seemed very respectful, but didn’t make him feel any better. He knew nothing of the fact that Nie Tian was the reason why the chosen ones had returned safely to the Domain of the Falling Stars, and why the sects had learned about the outsiders’ invasion plan. It was unprecedented that a young man from a remote place like the Realm of Flame Heaven should receive support from so many powerful forces from all over the Domain of the Falling Stars. “The Realm of Endless Ice, the Realm of a Thousand Devastations, the Realm of a Hundred Battles, the Realm of Unbounded Desolation, and the Spirit Condor...” Ji Qingyun weighed the matter in his mind for a short while, and came to the conclusion that he had to back down. He believed that even the Heaven Palace Sect would do the same if they were facing pressure from such a powerful alliance. Perhaps only by forming another alliance with the other powerful sects would they be able to contend against them. However, he knew perfectly well that the entire Domain of the Falling Stars was now facing threats from outsiders. The other powerful sects like the Heaven Palace Sect, the Flame God Sect, the Spirit God Sect, and the Poison Sect had all agreed to deal with the outsiders first. After all, they didn’t want to fight among themselves at such a crucial moment. Otherwise, the outsiders would be able to take advantage of the situation and crush them all effortlessly. He clasped his hands and apologized, “I didn’t know about the situation, so I said those things I didn’t mean. Sorry, sorry. As soon as he uttered these words, he rapidly gave Yu Wei and the others a meaningful gaze, and rushed towards the gate to the courtyard. “I was there and I watched it happen.” Nie Tian said. Xuan Ke, Chen Hao, and the others exchanged gazes with each other, but didn’t say a word. They were well-aware that it was him and Dong Li who had killed Yu Yang and Liao Yan. “Why would I?” Nie Tian’s face was still expressionless. “They had tried to kill me and take my valuables before the outsiders appeared. When the outsiders swarmed onto the island, I was fast enough to escape. It was because the outsiders were busy killing them that I was able to leave unhurried. “Good! Nie Tian! Good!” Ji Qingqun said, gritting his teeth furiously. After giving Nie Tian a murderous gaze, he dragged Yu Wei out of the courtyard. Zhan Lu was more like a pair of eyes than a sword. Black in color, the long, unmarked sword gave a sense of kindness and benevolence, rather than sharpness. Like the Heaven’s deep clear eyes, the sword watched the behavior of kings. If a king had moral integrity, then the sword would be with him and his country would be prosperous; if the king didn’t have moral integrity, the sword would leave him and his country would fall apart. Upon finishing the sword, Ou Yezi could not help shedding tears, for he finally realized his lifelong dream: forgin an unparalleled powerful sword that wasn't just a means of murder. Benevolence knows no enemy. The ZhanLu sword appears several more times throughout history... During the Jin Dynasty (265-420 A.D.), The ZhanLu was owned by famous general (or Judge) Zhou Chu who treated it as his most treasured possession. During the Southern Song Dynasty (1127-1279 A.D.), a descendent of general Zhou Chu presented the sword to the famous war hero Yue Fei to be used on the battlefield against northern invaders. 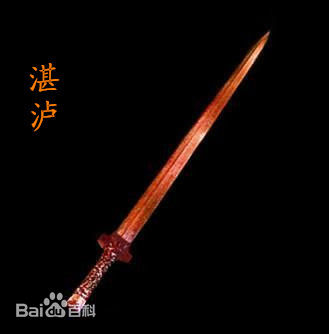 Some of the various descriptions of and traits applied to the ZhanLu sword include the following... it shimmered in the daylight and glowed in the evening. The sun, moon, and stars seemed to have lost their brilliance in it’s presence. Made from the essence of all metals, it contains the spirit of the sun. Drawn it gleams with life, sheathed it demands respect. It was reputed to be so sharp that dipped into water it could be withdrawn perfectly dry. It was also said to be able to roll up and extend at will. These references led to the sword being called Zhan Lu Shen Jian - "Magical Sword ZhanLu". Just after Goujian surrendered, King Helu of Wu died, as a result of an infection to a wound he received in battle. Helu's son Fuchai upon taking the throne of Wu had the Yuchang and Shengye swords along with nearly three thousand other swords entombed with his father. To ensure the secrecy of the location of the tomb, Fuchai had the thousand workmen on the project killed. Legend tells us that just after completion of the tomb a white tiger began appearing on the hillside where the tomb was located. The spot located near Suzhou City in Jiansu Province has since been named Hu Qui or Tiger Hill. Nearly three hundred years later the first emperor Qin Shi Huang (259-210 B.C.) who owned and loved the Taia Sword, sent out a group of men to find Helu's tomb and bring back the swords. They did a vast amount of digging but were apparently unable to locate the entrance to the tomb. The hole they left behind has over the years filled with water and is now known as the Sword Pond. In 1955 the pond was pumped dry and after some digging the entrance to the tomb was discovered. However it was not opened for fear that the Yunyan pagoda that was erected on top of the hill, that is already unstable and leaning like the famous Tower of Pisa, would collapse.